Heart recently hosted a dinner party and the most beautiful of plates were brought out. The plate on top is from the Hermès Cheval d' Orient line of porcelain. The said collection features ornate designs and details inspired by horse harnesses. Aside from the dessert plate shown above, it also has a round tray, a large vase, tea cups, and saucers, too. Click here to learn more. 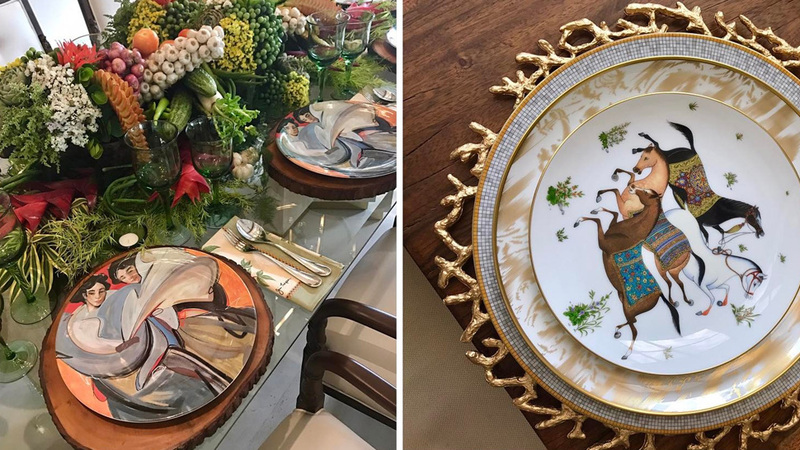 To complete the setup, she set the dessert plate on top of Haute Home Manila's Aurora Coral Plate Charger in Gold. The colors look perfect against the wooden table. Haute Home Manila offers handmade and hand painted must-haves. Follow them on Instagram. How pretty is this table setup? The Fornasetti plate takes the spotlight—with the red roses serving as a fitting backdrop. As if the plate isn't enough to capture your attention, the utensils were set on top Givenchy table napkins. To keep a wall at home from dull, a trio of Fornasetti wall plates were put up. We especially love the one in the middle with its gold finish. The woman whose face is always seen on Fornasetti plates is Lina Cavalieri, an Italian singer. While some would often forget about table napkins, it's one of the stars in this setup done by Heart's cousin Happy Ongpauco-Tiu for a gathering at home. The Jim Thompson table napkins work perfectly with the artsy plates and complement the wooden pieces included, too. Featuring beautiful fabrics in various designs and colors, these pieces by the brand are used in many bars and restaurants as well. Click here to learn more.